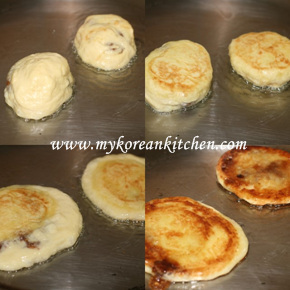 Korean sweet pancake made easy. 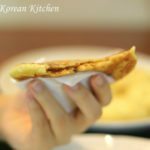 How to make Korean sweet pancake (hotteok) using pre-mix. An easy to follow instruction and helpful tips! Have you seen these pancakes before? 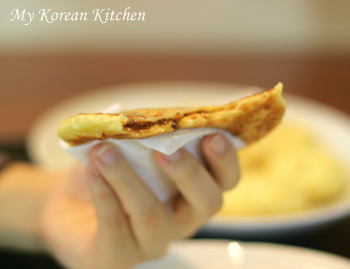 They are called Hotteok / Hodduk /Hoddeok (호떡), and you can easily spot them on the street, especially in winter in Korea. The other day, my self proclaimed elves (my sisters) found a Hotteok recipe on the internet and they were busy making them. They somehow miscalculated the amount of the ingredients, so it wasn’t quite as good as it could be, but it was still good for their first try. This is the premix packet for Hotteok and what is inside. There are Korean instructions on the side of the box and below is my English translation, plus additional opinions of mine. 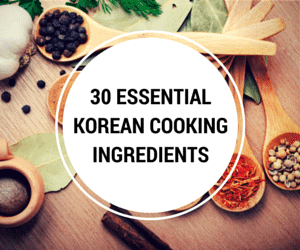 The extra ingredients you will need are: water 260ml and some vegetable cooking oil. Step 1. 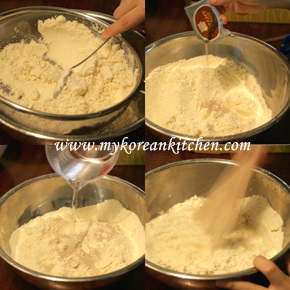 Sieve the premix (the yellowish packet), then add the dry yeast (silver packet) and water, knead it with a wooden spatula. Step 2. 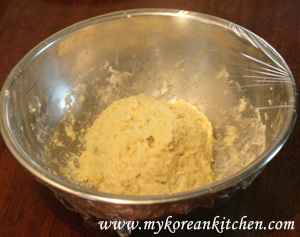 Cover the bowl with wrap, and ferment it for 2 hours at room temperature (20-25 ℃). The volume of the dough needs to increase by 2 times. Step 3. When the dough is ready, put some oil on your hands (for anti stick purpose) and separate an adequate amount of the dough(to allow ten pancakes to be made). Put one of the dough on your hand. Step 5. Pre heat the frying pan for 20 seconds and add some oil. Put 2-3 sealed dough balls onto the pan and cook them on medium to low heat. 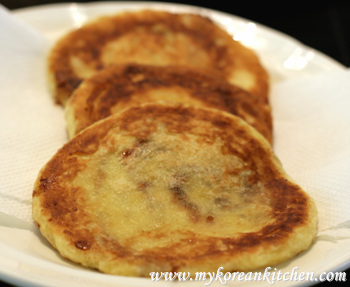 Turn them over when the bottom part is cooked and press the dough with a spatula. Step 6. When the both sides are golden brown, serve. It is best if you consume all the fermented dough (dough without the jam mix) on the day you make it. However, if you can’t finish it all, keep it in the fridge (if you are going to consume it within 24 hours), otherwise keep it in the freezer, and defrost it well before you use it. 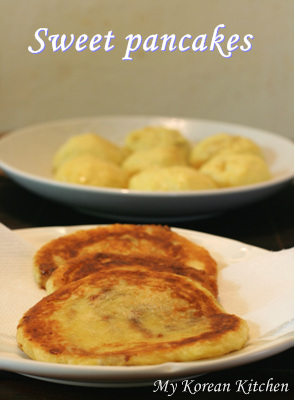 If you are interested in making these sweet pancakes from scratch, check out my homemade hotteok recipe. Sieve the premix (the yellowish packet), then add the dry yeast (silver packet) and water, knead it with a wooden spatula. Cover the bowl with wrap, and ferment it for 2 hours at room temperature (20-25 degree C). The volume of the dough needs to increase by 2 times. When the dough is ready, put some oil on your hands (for anti stick purpose) and separate an adequate amount of the dough(to allow ten pancakes to be made). Put one of the dough on your hand. Pre heat the frying pan for 20 seconds and add some oil. Put 2-3 sealed dough balls onto the pan and cook them on medium to low heat. 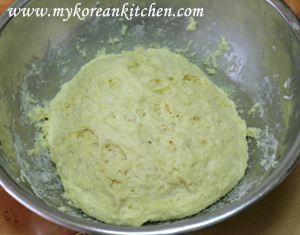 Turn them over when the bottom part is cooked and press the dough with a spatula. When the both sides are golden brown, serve. Thank you so much for this. I made hoddeok for the first time with a box mix and they came out perfectly! I owe everything to your article here. Thanks for posting this, found a box of the Q1 at ‘global market’ in Woodbridge VA, Oddly, there wasn’t a yeast packet, and the batter has a bluish color. I’m wondering if I have bought a variation. It was on sale, and I’m letting it rise now (Assuming the yeast is in the mix) will be giving it a go. Thank you for posting this as there are no english translations of the instructions. Thanks for posting the directions for these in english. I puchased the box at my local Korean grocery and didn’t check if english directions were provided. You are a lifesaver! OH!!! Wow do I feel like a dummy. I didn’t let it ferment and I had no idea why my dough was so hard to work with.. I guess that explains things. I purchased a package of the sweet pancakes. The problem is the pancake mix was written in english…no problems there. The jelly mix did not. I would like to make these but need directions on how to mix the jelly. I wondered the same thing at first. 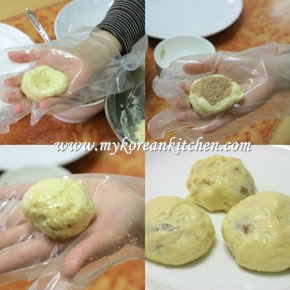 Really you just spoon the filling in dry and close up the dough ball. The moisture from the dough will turn the dry filling to jam (but it needs to sit for about an hour) or you can just cook the pancake and let it sit for an hour or so. They reheat nicely. Thank you so much for the recipe posting in English! My sister in law brought over the premix version months ago, and I’ve been wanting to try it… except my Korean is so rusty it would’ve taken me way too long to figure out the directions! Made them last night and I have the burnt tounge to prove it! 🙂 Haven’t had these in YEARS, and they’re soooooooooo good. I also was searching for the instructions. I bought these at a local Korean grocery store and couldn’t read the instrustions. Thanks. Thanks for sharing the recipe! I just stumbled upon your website… Can’t wait to try out some of your recipes! There are times I want to eat it and don’t want to use the box recipe. I also found this recipe and it works like a charm… if you use this bread: Rhodes Bake-N-Serv, http://www.rhodesbread.com/products/view/800, the dough tastes very similar to Ho-dduk. I couldn’t find it once and tried a generic Kroger brand and it worked as well. Newman- the ‘jam mix’ name confused me too, but it’s the sugar/cinammon combo that you use to fill the pancakes with. I may try the Sesame Filling. Hello! Thanks for sharing all your recipes! Another recipe for lazy students or people unable to get the premade package, is getting buttermilk biscuit tube and brown sugar. You just pull each biscuit out and put brown sugar inside and fry them in the pan. ^___^ I’m going to try your way with making it totally homemade. Very awsome. what is the “jam mix” that goes inside the dough ball?? Glad to hear that you found this post useful. oh right, I forgot to write about the pancakes! Like you said, the pancakes were very sweet; if i ever got these again, I’d probably use a lot less of that jam mix (even though there was almost a quarter of a ziplock bag left over when i finished preparing them). 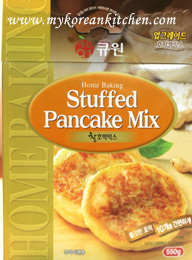 I know this is an old post but I just received a box of this mix from my parents when they came to visit me in college, and I found this really useful because I can’t read Korean (I’m Taiwanese), and there were no English cooking directions on the box. 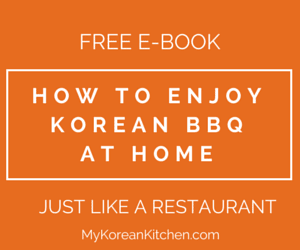 I also looked at your other recipes and I think I’ll try some of them out when I have the time (I’m a Korean food addict =] )! Keep up the great work! I already posted it. Here is the link. Do you know when you will post the homemade recipe? Dying to try it out. Thanks. Oh, this brings back a lot of memories from my time in Korea. I loved eating these fresh cooked from the street carts. The women that ran the carts usually cooked hoddeok, a walnut shaped pastry, and a fish shaped pastry but I can’t remember what these were called. I also tried to look for these packets in both Korean and English on the website I linked to, I couldn’t find them either. I think those three shops are the only online Korean grocery shops in the USA as far as I can search on google. I am sorry about that. However, if you are interested in making it on your own, I am going to do a post about the recipe on Monday, so you can try it from home. It is not that difficult to make, it takes similar time, and you will have most ingredients available at home. I just wanted to tell you great job on this site. I love it. I just found it a few days ago and I’m itching to try a lot of these recipes. 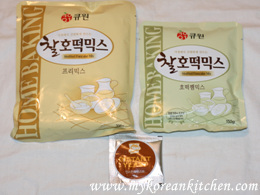 I’m not Korean but I lived in Korea for a couple of years and loved eating these on those cold days while I was there. Do you know of a web site where I could buy these mixes? I looked on the sites you have linked and could not see them. 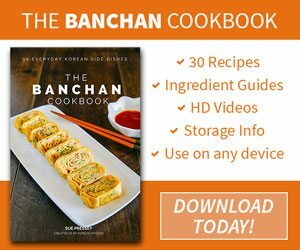 I’ve been very tempted to drive to Chicago (hour and a half away) just to find a Korean market to buy this and other Korean foods I’m craving. I think I am going to write about it next week sometime. So check it out. Kat, It was super sweet, but artificial sweet I say. Ellie, It has been a while since you had them. Do you even remember the taste? I am sure with your baking talent you can make one fine Hoddeok. Oh! I haven’t had these since I was a child and my mom used to make them for me in the winter-time! I’ll have to see if she can still remember her recipe for these wonderful treats! oh my gosh! I am totally craving one now… lucky for me I can just go out and get one cauz I live in seoul…thanks for the step by step! A fully homemade version? Soon? Those words are music to my ears! Being a huge fan of hoddeok, I am salivating over your pictures but I don’t have any of that mix (nor the possibility of acquiring any). Your pics are great!